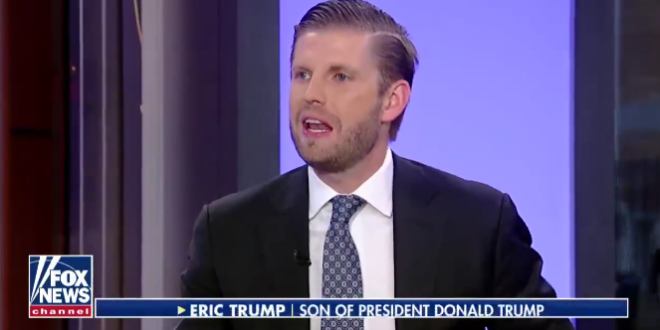 Eric Trump Defends The Dotard's Praise For Assaulting Reporters: This Is Actually Exactly Why My Father Won - Joe.My.God. “He wasn’t the guy that body-slammed anybody. He can have fun. By the way, this is actually exactly why my father won. Because so many people were so sick and tired of the little caged, the perfect, the perfectly scripted politician who memorized their little sound bite and went out there and had no crowds, and they weren’t any fun, and they had no charisma, they had no personality. He probably won because he’s un-PC.” – Eric Trump, speaking today on Fox. And this is what he said when asked about right wing outrage over Eric Holder’s recent comments.